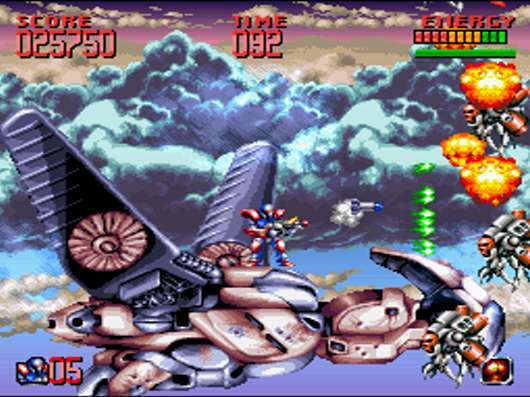 Super Turrican is one of the games for the Super Nintendo that, owing to the system, had “Super” tacked onto the front. Featuring a man in an armored suit, with some similarities to Metroid, this action platformer featured some incredible synthesized music. I have included a sample of this music below from Stage 1-3. My only personal connection with this game is through game rentals in my early teens, but I remember the music of this stage well, even now. Amusingly, in spite of the action nature of the game, this music instilled a Zen-like state of peace in my mind. Perhaps the better to go out shooting things with. Perhaps. This entry was posted in Japan, Music, video games and tagged 90's, culture, gaming, Japan, music, sci fi, Super Turrican, synth, video games, YouTube, Zen. Bookmark the permalink.